10.8 x 8.3 x 2.4 cm, IOT-GATE-iMX7 is built around CompuLab’s CL-SOM-iMX7 System-on-Module. Featuring dual Gbit Ethernet, 3G/LTE modem, WiFi 802.11a/b/g/n, Bluetooth 4.1 and ZigBee, IOT-GATE-iMX7 is an excellent solution for networking, communications and IoT applications. An assortment of RS485, RS232 and USB interfaces, makes IOT-GATE-iMX7 a versatile platform for industrial automation and control systems. UART, SPI, I2C and GPIO signals available on a dedicated header allow to utilize the i.MX7 built-in Cortex-M4 MCU for applications that require real-time I/O operation. Fanless industrial design, rugged housing and support for wide temperature range of -40C to 85C make IOT-GATE-iMX7 an ideal choice for industrial installations and harsh environments. In addition to wide range DC input of 8V to 24V, IOT-GATE-iMX7 supports PoE powered mode allowing to eliminate the need for PSU and simplify cabling. Modular design of IOT-GATE-iMX provides a unique advantage for fast time-to-market projects that require custom form-factor or functionality. Leveraging IOT-GATE-iMX7 for quick proof-of-concept and prototyping, customers are able to make a seamless transition to a fully custom design with CL-SOM-iMX7 System-on-Module while benefiting from proven hardware and existing software stack. 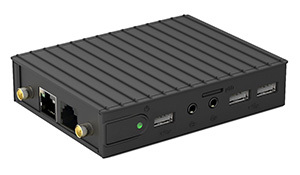 CompuLab is also offering IOT-GATE-iMX7 without the enclosure – as SBC-IOT-iMX7. Similar to other CompuLab products, IOT-GATE-iMX7 is offered with guaranteed 10-year availability. IOT-GATE-iMX7 is provided with ready-to-run Debian Linux and full Linux Board Support Package. The IOT-GATE-iMX7 BSP includes Linux kernel 4.1.15, Yocto Project file-system and U-Boot boot-loader. In addition, CompuLab will support IOT-GATE-iMX7 with mainline Linux, upstream Yocto Project and FreeRTOS BSP. IOT-GATE-iMX7 and SBC-IOT-iMX7 are available now through CompuLab’s worldwide distribution channel and through direct sales (www.compulab.com). IOT-GATE-iMX7 is offered at a variety of configurations starting from $107 for volume orders. SBC-IOT-iMX7 is offered at a variety of configurations starting from $85 for volume orders. Detailed ordering and pricing information is available at IOT-GATE-iMX7 and SBC-IOT-iMX7 product pages. NOTE TO EDITORS: For additional info and high-res product images please refer to the IOT-GATE-iMX7 press kit or visit www.compulab.com.